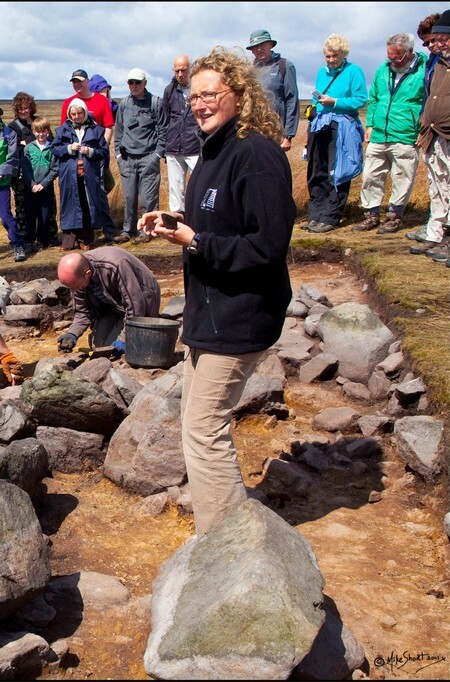 Louise Brown joined Pennine Prospects as ‘Community Archaeologist’ on the ‘Watershed Landscape Project’ in February 2012. The part-time post enables her to continue her freelance work where she has worked (and continues to work) on a variety of projects including ‘The Stanbury Hill Project’, a community archaeology project funded by the Heritage Lottery Fund and run by Bingley and District Local History Society in partnership with the University of Bradford. Prior to this she worked on the ‘Old Scatness Broch and Jarlshof Environs Project’ based in the Division of Archaeological, Geographical and Environmental Sciences, University of Bradford (1998-2010). The Project involved the excavation of scheduled broch site and surrounding village in Southern Shetland and now forms part of a wider vision for boosting heritage tourism in the area. The Project is being published in a series of monographs, of which she is an author. The first of the series was published in 2010 (Dockrill et al. 2010. Excavations at Old Scatness, Shetland Volume 1: The Pictish Village and Viking Settlement). Louise maintains her link with the Division, holding the post of ‘Honorary Research Fellow’, and remains a member of the North Atlantic Research Unit (www.brad.ac.uk/archenvi/research/NARU/Home.php). Her long time involvement in student training, both on-site and during post-excavation, has led to the formal publication of a case study in archaeological excavation where she was a key contributor and co-editor (Dockrill et al. 2007. Old Scatness Excavation Manual. A case study in archaeological recording). In her spare time, Louise sings with Huddersfield Choral Society and The Bradford Chorale. Tertia Barnett, Kate Sharpe, and Richard Stroud led the Northumberland and Durham Rock Art Project, run by Northumberland and Durham County Councils and funded by English Heritage, which trained local volunteers to record rock art, and produced the England’s Rock Art (ERA) website and database. Kate and Tertia recently published an edited volume, Carving a Future for British Rock Art. New directions for research, management, and presentation. Tertia Barnett has worked on a wide range of archaeological projects in Britain, Europe and Africa. After obtaining her PhD from Bristol University in 1997, she lectured in Archaeology at Nottingham and Cardiff Universities. She subsequently worked for English Heritage, Oxford Archaeology North and Headland Archaeology, and from 2004-2006 she was the Project Officer for NADRAP. She is an Honorary Fellow in the Department of Archaeology at Edinburgh University, and is currently project managing a new initiative entitled Scotland’s Rural Past, employed by the Royal Commission on the Ancient and Historical Monuments of Scotland (RCAHMS). This involves working with local volunteers across Scotland primarily to research, record and raise awareness of the many thousands of abandoned medieval and later rural settlements across the country. Her main research interest is in rock art, particularly in North Africa, and she is currently running a project to record previously unknown carvings in the south west of Libya (www.libyarockart.com). Kate Sharpe discovered rock art after a career switch from Information Management to Archaeology in 2003. Her doctoral research at Durham Univeristy investigated associations between rock art and landscape in Cumbria. She worked as a Research Associate on the Breaking through Rock Art Recording Project at Durham University, exploring the potential of laser scanning for the recording of prehistoric carvings in Northumberland and Cumbria. In 2006 Kate took over from Tertia as NADRAP Project Officer, seeing the project through to the launch of the website in 2008. In 2010 she joined the International Centre for Cultural and Heritage Studies at Newcastle University to work on the Rock Art Mobile Project, an AHRC funded initiative which aims to enhance the visitor experience at rock art sites in Northumberland using mobile phones. She edits a newsletter on British rock art called Rock Articles. Richard Stroud has been an independent rock art researcher since 2002, joined the NADRAP project as a volunteer in 2005 but soon became part of the management team, acting as Volunteer Co-ordinator for the final two years of the project. He was integral to the development of photogrammetry as a rock art recording technique and has since applied his expertise in the technique on five volunteer led projects. He has also carried out consultancy work for English Heritage, Yorkshire Dales National Park Authority and City of Bradford Metropolitan District Council and recently joined an ongoing rock art recording project in Armenia as their photogrammetry specialist.